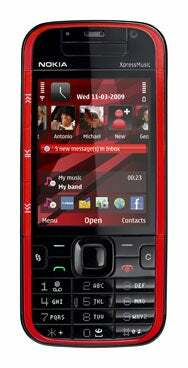 The 5730 XpressMusic is a side-slider and Nokia’s first music-centered device to offer a QWERTY keyboard. Nokia has been tight-lipped about the success of Comes With Music. However, the recent decision by a U.K. reseller of Comes With Music phones, Carphone Warehouse, to cut the price of the Nokia 5310 isn’t a good sign, according to analyst Paolo Pescatore of CCS Insight. Discussions with Carphone Warehouse have also led Pescatore to believe that Comes With Music hasn’t been as successful as the phone reseller had expected, he said. The 5730 XpressMusic is a side-slider and Nokia’s first music-centered device to offer a QWERTY keyboard. It comes with support for both Wireless LAN and HSDPA (High-Speed Downlink Packet Access) at 3.6Mbps. Music is stored on an 8GB MicroSD memory card. The phone will ship in Europe during the third quarter and cost about €280 (US$356) before operator subsidies and taxes. The 5330 XpressMusic will also ship during the third quarter and cost about €160 before subsidies and taxes. It’s a 3G phone that stores music on MicroSD cards, although none are included in the box. The phone will be available in North America and Europe, Nokia said. Finally Nokia also announced its first mobile phone with an internal FM radio antenna: the 5030 XpressRadio. It will ship during the second quarter and will cost €40 before subsidies and taxes, making it Nokia’s cheapest radio-equipped phone yet.